Huawei mobile devices have been a consistent part of the Globe's postpaid plan for years now, and it seems the partnership will continue for quite a long time. 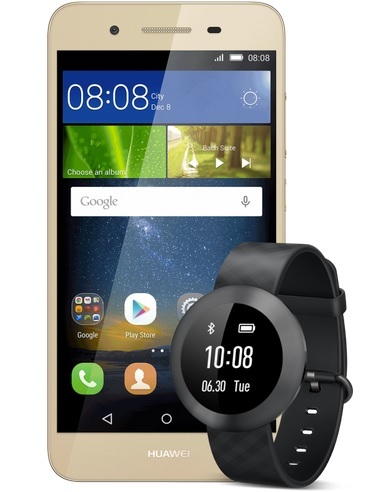 Recently, Globe Telecom announced not one, but two of them under a single myLifestyle Plan, the Huawei Gr3 and Huawei Band B0. The GR3 + B0 Watch can be yours for free under myLifestyle Plan 999, which includes unlimited calls and texts to Globe and TM, 3GB data allowance plus free 1 month Gadget Care, 1GB Globe Cloud, 3 months 1GB Spotify Premium or HOOQ, and 1 month of either Navigation Pack, Explorer Pack or Fitness Pack. There is also an option for consumers to get it at a lower plan, which is myLifestyl Plan 599, however, there will be a one-time cash-out fee of Php4,800. The Huawei GR3 sports a 5-inch display with 720p resolution powered by 1.5GHz 64-bit octa core MediaTek MT6753T processor coupled with 2GB of RAM and 16GB of on board storage. This dual SIM device also has 13MP primary shooter and a 5MP camera in the front for taking selfies. Meanwhile, the Huawei Band B0 is a stylish watch that doubles as a fitness tracker and a notifier.